The European Dead Zone is the biggest area in Destiny 2, and features a new vendor, as well as multiple missions and quests to comb through. Learn about EDZ tokens and vendors. The European Dead Zone is the largest open area in the base version of Destiny 2, and it's still one of the larger areas in the game even if you factor in the DLC expansions. In this Destiny 2 European Dead Zone guide, we'll be walking you through everything there is to know about the large area, including how to get EDZ Tokens quickly, so you can trade them in to Devrim Kay. As for everything else to do with Destiny 2, including all the info you need on every Super Ability, character Subclass, Exotic Weapon, and pre-order bonus, head over to our Destiny 2 everything we know guide. The Destiny 2 European Dead Zone is the largest playable area ever created by Bungie, going far beyond the reaches of any other area that we got to roam around in the original Destiny. While it was set to feature in the expansion that would become The Taken King, the European Dead Zone has been held back for Destiny 2, where various Taken and Red Legion factions will be roaming. As we stated above, there are factions of both the Taken and the Red Legion working in the European Dead Zone, meaning that although it's the biggest area in the game to date, it isn't exactly a walk in the park to make it through the zone alive. Firstly, you've got your standard Patrol missions making a return from the original Destiny. We'll delve into more detail about Patrol missions in the section below concerning Devrim Kay, but the missions themselves largely return in the same manner - all you'll have to do is go to wherever the NPC tells you to, and kill whatever they tell you to. In an early Patrol mission, Hawthorne needs you to boost her radio signal, so she can reach survivors from the attack on the Last City. It's a straightforward mission, and you can tell by the recommended Power level next to the mission whether you're up to the task. There's also a Lost Sector in the Destiny 2 European Dead Zone, which can be found from the Trostland Landing Zone, towards the southeast side of the Dead Zone. Check out the video just below for some footage of the Lost Sector in the European Dead Zone, which contains a fair few Fallen enemies, with a couple of mini-boss enemies along the way. You can actually expect to find Lost Zones in just about every single area of Destiny 2, with the obvious exception of places like the Farm. You can find a fair few Lost Sectors scattered around the planets of Earth, Io, Nessus, and Titan, and all of them will offer different loot items and different mini-bosses. There's a brand new vendor that you can encounter in Destiny 2's European Dead Zone, and his name is Devrim Kay. 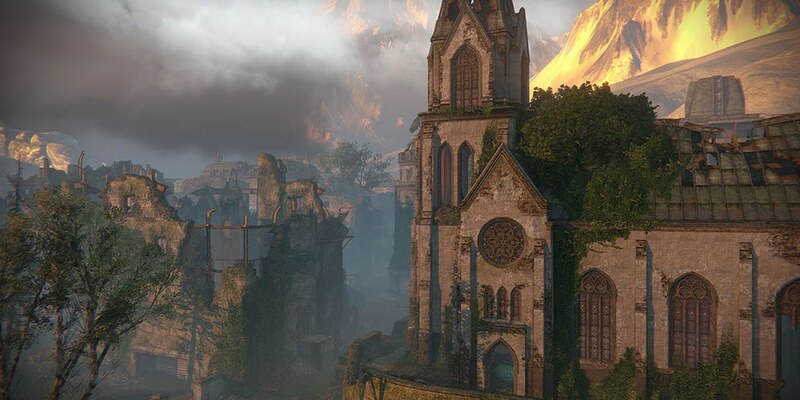 Firstly, you can find Devrim at the very top of the church clocktower in the Dead Zone, which can be seen from the surrounding vicinity. Take a look at the picture just below, so you know exactly what building you're looking for. The church of Devrim Kay. Devrim Kay offers you various Patrol missions in the European Dead Zone, such as a Salvage Mission called 'These Don't Belong to You', in which the player has to destroy Fallen enemies in order to recover 11 Forgotten Journal items. Once you've eventually recovered the 11 Forgotten Journals, Devrim Key will congratulate you over radio, and grant you an EDZ Token. But, you'll also be given an EDZ Token every time you take part in a Public Event in the European Dead Zone. These are small tasks that anywhere in the area can take part in, and all you have to do is open up the local map, and choose which Public Event to track. See the event through to the end, and you'll always be rewarded with an EDZ Token. These Destiny 2 EDZ Tokens can then be taken back to Devrim Kay and traded in, all of which go towards filling a bar near the top of the screen. Once you've traded in enough EDZ Tokens (roughly 18-22) to max out the bar, you'll be given a group of randomised Rare weapons from Devrim. You can repeatedly max out the bar to earn new weapons from the vendor, but it should be noted that it takes more EDZ Tokens each successive time you max it out. If you don't have enough Destiny 2 EDZ Tokens to level up your rank with Devrim, then you could resort to spending some Glimmer on any of the weapons or armor pieces that he offers. These will never be a higher rank than uncommon (green), but they can give your character a nice Power level boost early on in Destiny 2. We've got loads more Destiny 2 for you on USGamer. Check out our Destiny 2 Crucible Guide. We've got info on finding Xur in Destiny 2, and a look at exotic weapons in Destiny 2 (including how to get the Rat King in Destiny 2 and how to get the Mida Multi-Tool in Destiny 2) and exotic armor.